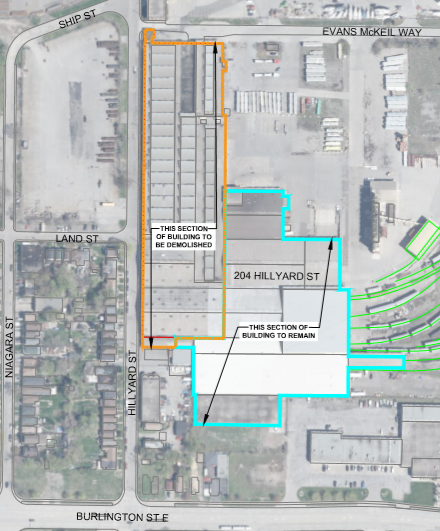 HPA is redeveloping the large industrial warehouse at 204 Hillyard Street. The project will include renovating portions of the building to better accommodate existing tenants. Another unusable portion of the building will be removed. HPA is currently redeveloping the western portion of the port lands to create new cargo and employment areas. Shed 11 is an older warehouse complex that doesn’t meet the needs of modern users. Through this redevelopment, we will be able to use the space more efficiently, and accommodate more employment uses. What will be taking place on-site? Installing new utilities (water main, sanitary sewers, electrical service, gas service). Safe removal of any designated substances. Renovating the portions of the building that will remain, including installing new exterior cladding, windows and doors. Demolition of identified portions of the building. Removal of all waste from the site, including recycling of metals and other materials. Recycling all concrete, brick and block, by crushing it into gravel for re-use on the construction project. Installing perimeter fencing and landscaping. Work is only allowed during the windows set out in the City of Hamilton’s Noise Control By-law. The contractor is responsible for managing any dust generated by the project. They will be required to do misting in order to reduce the amount of dust during construction. They will monitor wind speed and direction, and will adjust their operations as needed. Silt and erosion control will be addressed with silt fencing at the perimeter of the job-site. A pest control plan will ensure that any pests in the warehouse are removed prior to demolition. The project is expected to start in February and will be complete before the end of 2019. What will it look like when it’s done? The sketch shows the updated layout of the building. Renovated portions of the building will have new cladding, and the areas next to the street will have new fencing and landscaping.